The below is from the first post on their blog back on Feb. 29, 2008. Our robot found more groups after the below group stopped updating their blog. The set of groups are just fantastic and a lot of fun to view. I Highly Recommend spending some time looking over the 6 websites listed as of today. 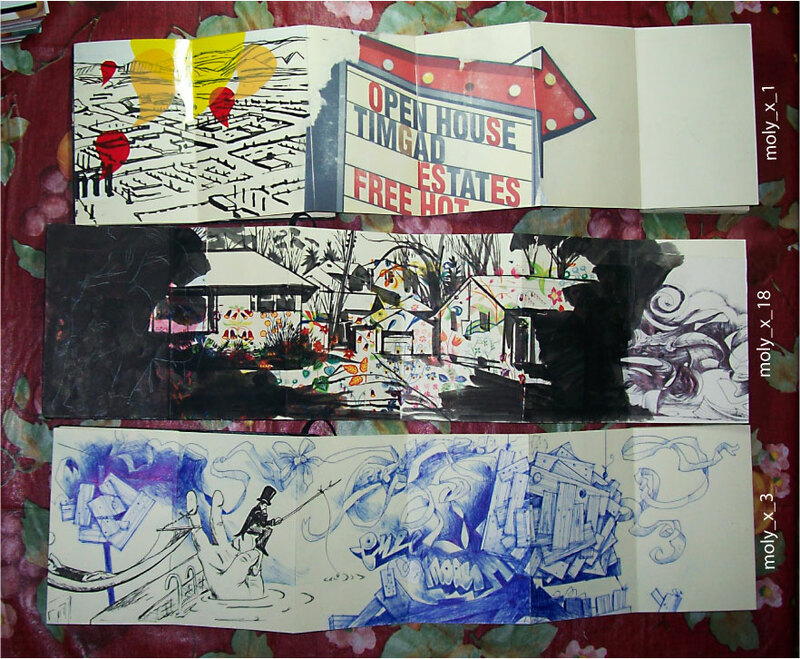 Follow the adventure of this group of artists from around the world, in a Japanese fold Moleskine sketchbook exchange. This group, founded by Beá Miera (Brazil) and Marty Harris (USA), is an extension of the Moleskine Exchange. This blog will follow the adventure of a group of artists around the world, in a Japanese fold Moleskine sketchbook exchange. Each artist will set off with a small Japanese (accordion) folded Moleskine. Creating a drawing, collage, or painting, then send on to the next artist. Each artist will draw on a couple of spreads (3-4 pages) then send it on to the next artist. When the artists book is filled, it will be returned to the owner with images created by artist around the world. Each artist has a month to make an entry. The outcome will be a pleasant and surprising adventure, as artists are encouraged to interact and merge their art with others. 1. The artists start with the Japanese fold Moleskine – Name, address, email address written in book. 2. Each artist gets 1 month to make a sketchbook entry, and mail it to the next person. The order is listed to the right. 3. Each artist will do 3-4 pages each round. 4. Artists are encouraged to interact with other images in the book. Please be respectful. 5. When the book is full, when one side of the unfolded book is filled, the book will be sent back to its original owner. That artist may continue by buying a new book and sending it to the next person. 6. If a person decides not to continue, she will simply keep her book when it comes back to her. She should email all of the participants to say she is not going to continue. We will decide, then, if we want to find a new person. 7. Please communicate regularly via email. Let each person know that you have received/sent the book. The goal is to have a dialogue. Any comments and questions are welcome.